Of course there's a magnet under there stuck to the metal of the cubical. The magnetic field lines and the rippled surface of the Thinking Putty are really showing! Cool stuff! Thanks. I've got a new color getting ready to launch and I'm looking for three lucky blog readers to test out a free sample. The first three commenters on this post will get a private email asking for their mailing address. All I ask is that you let me know how you like it! 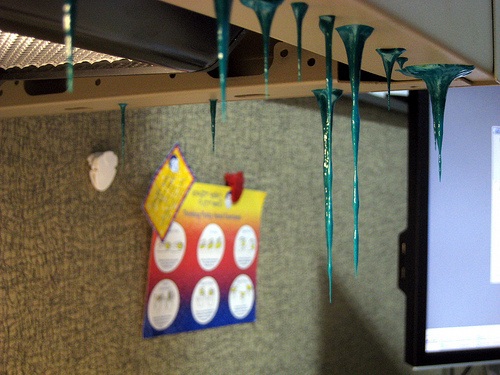 He says, "Crazy Aaron's Thinking Putty drooping down in stalactite from from an office cubicle shelf. It bounces, it stretches, it breaks it tears, it oozes. So much fun and so many colors." Who Wants Some Free Off-Color Thinking Putty? I've got some off-color putty here; the results of a few color mixing jobs I did for corporate clients. They are definitely cool looking, just not quite 'right' for sale. The first two people to comment below AND post a witty haiku about putty will get them free. Enjoy!